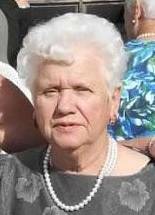 Betty J. Damen, age 79, passed away peacefully surrounded by family December 8. She is preceded in death by her husband John and daughter Terry. Loving mother of Jo Marie Adams (Jarett) and Jon Damen. Beloved grandmother of Michael Adams Jr. (Janelle) , Brittni Adams, Amy Lins (Bryan). Cherished Great Grandmother of Nathan, Daxton, Delanie and Kaitlyn. The family has decided to not have any services at this time. A burial will take place at Grandlawn Cemetery.